The Elderly and Disabled Administration in Aalborg wanted fresh eyes on their home support offer to anchor the service in the citizen’s needs, behaviours and dreams for the future. We got to know Aalborg very well! We interviewed citizens who received home support and spent time with them in their homes. We also talked to the personnel performing the home support and together we tested three new concepts for a new and improved service. We explored the complicated relationship of dependence and progress between the citizens and their home supporters and developed a new service design, suggesting a radical change in the structure of the service. Creating a new service design for vulnerable citizens, by finding the link between happiness and independence. Happy and independent isn´t doing things alone. It´s doing things yourself. What does it mean to get by on your own as well as possible when you are mentally ill or brain damaged? What is the correlation between happiness and independence? As we submerged us self in the task of reinventing the home support offer in Aalborg Municipality these were the questions we were faced with. Redesigning the home support service in Aalborg was no easy task. Based on the wishes of the Elderly and Disabled Administration in Aalborg we set out to create an individually adapted and targeted service that could develop the citizen’s ability to master daily life. However, as we soon realized, the life of citizens who depend on home support is filled with paradoxes: They need meaningful relations to others but can´t take care of themselves. Their diagnosis gives access to support but alienates them from their network. They want to get better, but are afraid of losing their support if they do. For many, the home support was their lifeline, their gatekeeper to the municipality and their best friend – leading us to coin the term ´the professional best friend´. Each citizen had very different preconditions and resources and therefore, it also differed greatly from citizen to citizen, what degree of independence they could realistically achieve. I will continue to get periodic depressions for the rest of my life. But that doesn’t mean I’m not a person. For good and for bad. To get to know the needs and dreams of the citizens who receive home support, we conducted long interviews with them, visited them in their homes and participated in group support with them. Through various ethnographic methods we discovered discourses about illness and normality and untangled the complicated relationship between citizen and supporter. With this strong knowledge foundation, we defined a bunch of interesting areas for development and then invited in home supporters and caseworkers from the municipality for a co-creations workshop. We began the workshop by working together to condense the vast amounts of insights into tangible problems, taking a design thinking approach. Next step was the ideation phase, and a long list of crazy and innovative ideas for service improvements emerged as the participants turned problems into to solution. Specifying and concretizing these concepts we ended up with three prototypes. These were isolated services with testable effects that could provide general learnings for the new service design. Over the next two months we travelled back and forth from Aalborg to Copenhagen to test the prototypes, working closely together with home supporters and caseworkers to identify benefits and pitfalls of the service prototypes. In the end, Aalborg Municipality got a comprehensive new service design based on learnings from the test phase. Pains and gains from the three prototypes were evaluated in collaboration with home supporters and caseworkers ensuring implementable solutions, a united culture change and a deep anchoring of the insights. 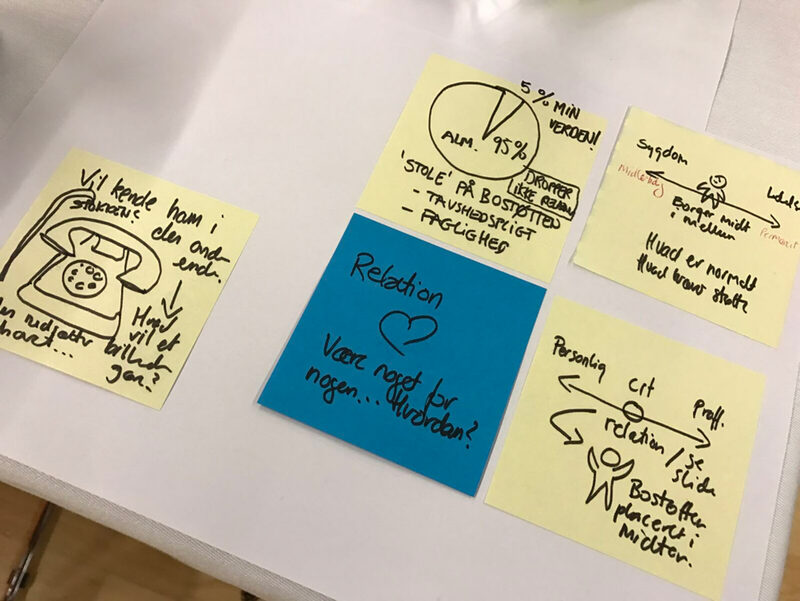 The final service design contained new ideas for cooperation between different parts of the municipality as well as easy to follow guidelines for the future development of the service. For every aspect of the service design we specified potentials for both citizens and the Municipality and offered solutions for involving the local community. The new service design was informed by a wide-ranging analysis, that offered deep insights on how the citizens perceive their life situation, live with their illness, express dreams and hopes for the future and navigate the municipal system. The analysis challenged the home supporters’ and caseworkers’ views on themselves, each other and their role in the citizen’s life and development. Lastly we identified specific gaps between the structure of the service today and its desired outcome. We used these gaps to communicate certain tensions between the alleged purpose of the service and how it works today. This provided the Elderly and Disabled Administration in Aalborg with an understanding of inherent problems in the current service design and possible roads to follow in the future development of home support.